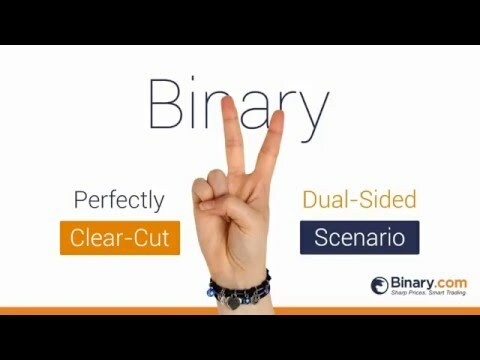 Binary.com is pleased to introduce a very short training video, designed to explain the fundamental basics of binary options trading to new visitors. We’d love to hear your thoughts about this new video! Please send your feedback to marketing@binary.com. We’re eager to hear what you think! Since 1999, we’ve been a true pioneer in the Binary Options Trading industry, with a flexible, award-winning platform fully licensed, safe, and secure business practices and exclusive, patented pricing technology, hosting over $2 billion in trades to date. But what is “Binary Options Trading”? It’s a special type of online trading with a fixed payout, in which you predict the outcome from two possible results. The word “Binary” in Binary Options Trading comes from the choice of two potential outcomes, in a perfectly clear-cut, dual-sided scenario. Will the price of Gold trade higher than the current spot price in 15 days? -Yes, it will trade HIGHER. -Or no, it will trade LOWER. -If your prediction is correct at the end of the set period, you’ll receive the payout that was determined at the start of the trade. Note that this amount is automatically calculated and reported to you through Binary.com’s pricing technology, before you even press the button to purchase this trade. -If your prediction is incorrect at the end of the set period, you’ll only lose your initial stake, and no more. Note that the stake is equal to the amount that you initially pay to purchase the trade – so there are absolutely no surprises. Thus, as you can see, Binary Options Trading is a very easy form of online trading, with entirely predictable outcomes. With Binary.com, you know exactly what you stand to gain or lose before purchasing each and every trade. There are never any hidden fees or commission; what you see is precisely what you get. And you can jump in and start trading with as little as $5!